Syrian rebels say a ceasefire deal to allow fighters and civilians to be evacuated from eastern Aleppo is back on, hours after it collapsed. Spokesmen for three rebel group said the ceasefire would go into effect later Wednesday night and implementation of the deal would begin early Thursday. Removing people from a sliver of territory the rebels still hold in eastern Aleppo was supposed to begin at dawn Wednesday, but shelling resumed in the morning hours. Rebels accused the Syrian government and its allies of derailing the deal by introducing new conditions. Russia's defence ministry accused the rebels of breaking the agreement. ​Ahmed Karali, spokesman for the Ahrar Sham rebel group, said Wednesday that the deal was salvaged. He said the first group of wounded fighters and civilians would begin leaving early Thursday morning. Two other rebel spokesmen confirmed that. Earlier Wednesday, shelling and airstrikes resumed over Aleppo, ending the beleaguered Syrian city's previous ceasefire after less than 24 hours and stalling efforts to remove residents from the shrinking rebel enclave in its eastern neighbourhoods. It wasn't immediately clear if the planes were with the Syrian government or its ally Russia which, together with Turkey, brokered the ceasefire. Turkey backs some of the rebels fighting to topple Syrian President Bashar al-Assad. The attacks broke out not long after evacuation efforts failed to start as planned Wednesday morning. Doctors Without Borders said the remaining doctors in the square mile of eastern Aleppo under attack are "terrified" of possible retaliation from pro-government forces and want to leave. Teresa Sancristoval, of Doctors Without Borders, said the doctors who are regularly in touch with her group "feel abandoned to their fate and with no way out." Doctors in the besieged strip have already been overwhelmed, and only one health facility remains operational. Rescuers said the wounded and the dead are being left on the streets because of the intensity of the attack. "People are losing any kind of hope," she said. The UN said it was not involved with the evacuation, but was ready to help. "[The UN] stands ready to facilitate the voluntary and safe evacuation of injured, sick and vulnerable civilians from the besieged part of the city," the UN Office for the Co-ordination of Humanitarian Affairs said in a statement. 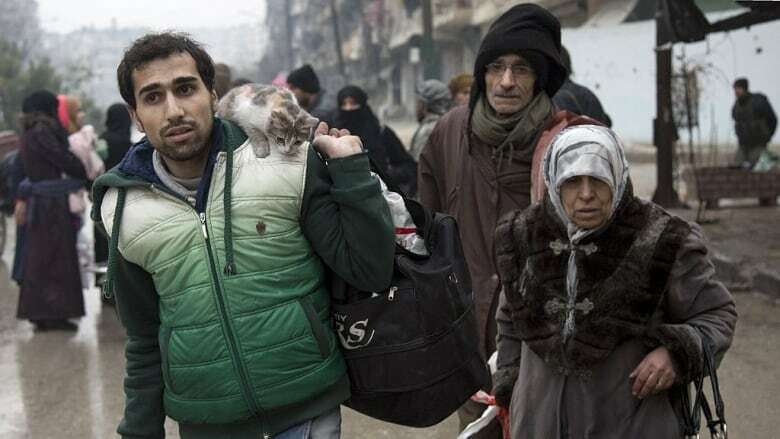 The evacuation follows two weeks of rapid advances by the Syrian army and its allies that drove insurgents back into an ever-smaller pocket of the city under intense airstrikes and artillery fire. 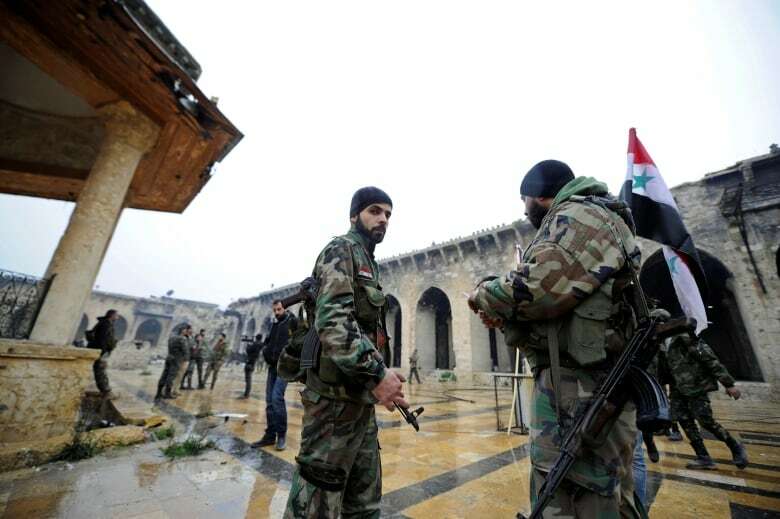 Rebel groups have been supported by the United States, Turkey and Gulf monarchies, but the support they have had has fallen far short of the direct military backing given to Assad by Russia and Iran. Russia's decision to deploy its air force to Syria 18 months ago turned the war in Assad's favour after rebel advances across key areas of western Syria. In addition to Aleppo, he has won back insurgent strongholds near Damascus this year. However, Assad is far from taking back all of Syria. Wide areas of the country remain in the hands of armed groups including ISIS, which this week managed to retake the desert city of Palmyra from Syria's army. Russia regards the Syrian military's win in Aleppo as a major victory against terrorists, as it and Assad characterize all the rebel groups, both Islamist and nationalist, fighting to oust him. But at the United Nations, the United States said the violence in the city, besieged and bombarded for months, represented "modern evil." The once-flourishing economic centre with its renowned ancient sites has been pulverized during the war, which has killed hundreds of thousands of people, created the world's worst refugee crisis and allowed the rise of ISIS. Tens of thousands of them fled to parts of the city held by the government or by a Kurdish militia, and tens of thousands more retreated further into the rebel enclave as it rapidly shrank under the army's lightning advance. U.S. Ambassador to the UN Samantha Power on Tuesday said the governments of Syria, Iran and Russia have put a "noose" around the civilians of Aleppo. "It should shame you. Instead, by all appearance, it is emboldening you — you are plotting your next assault," Power said before the security council.